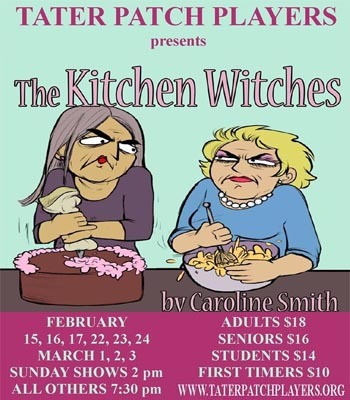 Description: The Kitchen Witches - by Caroline Smith. Isobel and Dolly are two “mature” cable-access cooking show hostesses who have hated each other for thirty years, ever since Larry Biddle dated one and married the other. When circumstances put them together on a TV show called The Kitchen Witches, the insults are flung harder than the food! Despite the producer's best efforts, the rivalry escalates into hilarity. Tickets are $18 for adults, $16 for seniors, $14 for students and $10 for First Timers. They can be bought in advance on the troupe's website at www.taterpatchplayers.org or on their Facebook page. The box office opens one hour before curtain time. Tickets/Signup: Please address questions or comments to taterpatchplayers@gmail.com or leave a message at 706-253-2800.